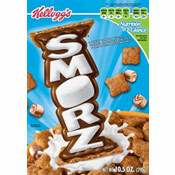 Which cereal was the first to offer a premium (something free with purchase)? This cereal has been described on the box as a "high fiber cereal... (a) quartet of flakes, blossoms, granola & raisins." The cereal provided "nearly 33% of your daily fiber needs." A description of the cereal on Kashi's website adds more adjectives: "plump raisins, crunchy fiber blossoms, light and crispy flakes, tasty granola and a hint of real cinnamon." 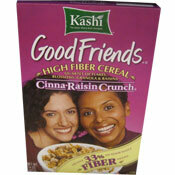 What do you think of Good Friends: Cinna-Raisin Crunch? This cereal is a good source of fiber. I switched to it when I realized that all the raisin bran cereals I bought were 1) lower in fiber and also contained high fiber fructose which I was trying to stay away from. Initially, I thought it was a bit different/strange, but after a few bowls, liked it better than the other brands.